Welcome back for the second half of our Spring Term! We hope you have had a wonderful half term holiday! 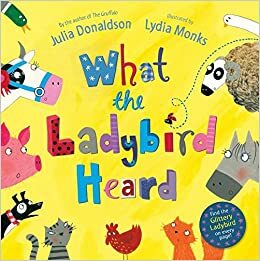 This half term we are immersing ourselves within the story 'What the Ladybird Heard' by Julia Donaldson. The story, set on a farm, explores the problem of stealing and taking things without consent. A little spotty ladybird who is reluctant to talk overhears a cunning plan to steal the farmer's prize cow and the farm animals hatch a plan to foil them! We will be using this text as a stimulus to explore farm animals and minibeasts, including categorising them by their features, describing them in our writing and creating our own artistic interpretations! Later in the half term we will be exploring life cycles of certain animals and minibeasts, such as ducklings, frogs and butterflies. We may even have some little visitors to our class! Within our Literacy sessions we will be beginning to develop out ability to describe settings and characters and we will be beginning to write our ideas in short sentences. We will be becoming storytellers and will be retelling and re-enacting the story in a variety of different ways, using different props and resources. We will be developing our use of story language and will be performing the story in our class Golden Assembly! We will be continuing with our daily phonics sessions and developing our confidence and fluency when reading independently! We are continuing to learn Phase 3 digraphs and are reading an increasing range of polysyllabic words and words with consonant blends. We are looking forward to meeting new monsters from Monster Phonics Land to help us with our reading! During our Mathematics sessions we will consolidating our knowledge of numbers to 20 and beyond. We will be investigating how we can manipulate and change quantities by adding numbers together and subtracting numbers from each other. We will be continuing to use our mathematical skills both indoors and outdoors to problem solve and reason, and will be adding further mathematical language to our vocabularies. We will be exploring shape, space and measure later in the half term, including 3d shapes, methods of measurement and time. We are thoroughly enjoying challenging ourselves in Reception and are becoming very independent and self sufficient learners! We are taking on weekly challenges to practise our skills and implement our knowledge independently. We are working hard to ensure we develop a range of skills in our independent learning and play and are seeking out challenge in all areas of the classroom. We are trying our best to complete all six weekly challenges to complete the rainbow! We have made an excellent start to the half term and cannot wait to investigate all things alive! Thank you for your continuing support at home!